The last Noring/McGee release I reviewed was Random Sound Generator, which I recall as being something of a departure from the duo's typically aggressive sound sculptures. 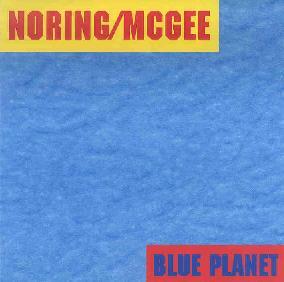 Blue Planet is also somewhat different, being the most cosmically alien of the Noring/McGee collaborations I've heard, though still firmly in the experimental sound sculpture realm. There's lots happening on this 67 minute set, and like anything from the Hal camp you need to put on the headphones and strap yourself in for a close listen. This is the kind of sound freakout stuff where you've been placed inside the engine room of an aircraft in full flight. If you listen closely you'll recognize many of these sounds as brief moments or secondary parts of your favorite sci fi film soundtracks. But listening to multiple layers of these sounds taking front and center stage offers much to the receptive imagination. Headphones firmly clamped over my ears, the sounds have a direct feed into my brain. And as I listen I'm picturing a massive space station and marveling at the power it must take to make such a thing work. And all the machines working together, no matter how advanced and sophisticated, are going to make noise. Steady repetitive electronic patterns that are more paralyzing than meditative serve as the foundation against which meteor shower alien electronics pummel my brain. And throughout the entire set it seems to be the combination of steady tones and pulsating waves that have the strongest effect. I also dig these rapid-fire pulsating patterns which are continually shifting in speed and volume, reminding me a bit of the machines the bad Martians in the old Roger Corman flicks used to use to bend the humans to their will. There are, of course, noisier moments that recall the more trademark Noring/McGee sound, but even these don't stray too far from the alien nature of Blue Planet's theme. Even a space station doesn't just sit around in orbit sipping martinis all the time and needs to fire things up and go elsewhere once in a while. And when Brian and Hal gear things up for that move you better have your hand on the volume control because screams and wails will be piercing your brain from all directions. I guess you can tell I let my imagination run wild listening to this stuff but it really is a lot of fun and if you approach it with an open mind you'll hear and experience what I mean. Fans of all things not of this Earth should check it out. See the AI alpha index for loads of other reviews of Hal's music. For more information you can visit the Haltapes web site at: http://hometown.aol.com/haltapes1/index.html.